Found 5 blog entries for August 2012. Thursday, August 30th, 2012 at 7:04pm. Totally renovated Tottenville colonial home. Located on a quite street in the heart of Tottenville. Eat-in-Kitchen with granite counter-tops and back splash, Porcelain tiled floors, and new stainless steal appliances. This home is move in ready. Friday, August 24th, 2012 at 10:06pm. Own this lovely 2 bedroom 3 level townhome w/ garage and country club amenities. ONLY $249k. Walk to everything and close to expwy. This can be yours for less than rent! FHA approved and interested rates are at a historic low of around 3.6%. Some come to my open house on Sunday August 26, 2012 from 12-2 pm. If you have any questions, please call Kerry DeBellis 347-234-7408. See you there! Thursday, August 16th, 2012 at 1:44pm. For centuries, ice harvesting had been a big part of the winter season.During the 19th century, the harvesting of Silver Lake's ice was very important.During the remaining seasons, the lake was used for swimming, boating, fishing, and ice skating.The area also held 1897's National Skating Amateur Championship races.Around 1911, refrigerators were made available to the United States, rendering the industry of ice harvesting useless.In 1917, Silver Lake was drained to be used as a reservoir. It was later replaced by underground storage tanks. Wednesday, August 15th, 2012 at 12:22pm. Old Town Playground is a small parcel of land, which is roughly two and a half acres in each Houses complex, which was built across the street from this site. Just a few years later, the Board of Estimate transferred the property to be operated by both the New York City Department of Parks and Recreation and the Board of Education. This was due to the fact that Old Town Playground is located next to Public School 46. 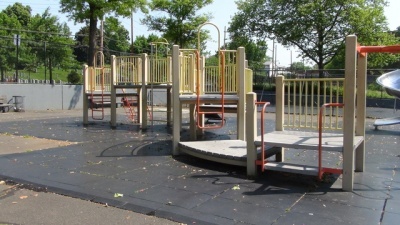 Old Town Playground received its name from the first settlement that was set up on Staten Island. 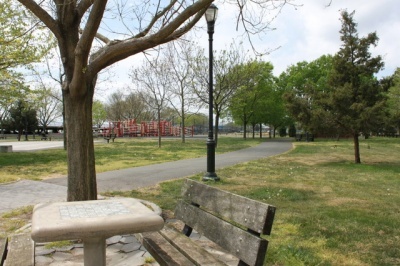 This park was in the confines of this settlement when it was first established. Since the original settlement was split up into a few neighborhoods, today the park sits in the neighborhood of South Beach. Wednesday, August 15th, 2012 at 12:15pm. In 1906, Happlyland Amusement Park opened in South Beach, on the East Shore of Staten Island. The amusement park was very popular in its day, attracting residents from nearby boroughs as well as Staten Island inhabitants. There were concession stands, a carousel, Vaudeville performance, a pool, and more. There were also small hotels which lined the beach for vacationers. During the first third of the 20th century, fires began to destroy what had developed into a summer resort. While Happyland was rebuilt each time, it finally saw its end in the early 1930's, when the rebuilding of the park proved to be financially futile.